If you haven’t printed it yet, there is still a nice high-value coupon available to print to Save $1.00 on FOUR CUPS Yoplait Original or Light Yogurt at zip 77477. Note- this coupon is void void in LA, NJ, ND, NV & TN. 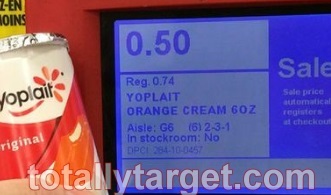 If you don’t see a sign at your store- be sure to scan just in case- the Yoplait sale signs seem to be sparse for many of you this week! -Thanks for the heads up Melissa! New High Value Valentine’s Cartwheels Today Only! We have some new high value Valentine’s Cartwheels good today only! Some of them have limits, and these will probably go fast, so I would add them to your cart if you have interest…. 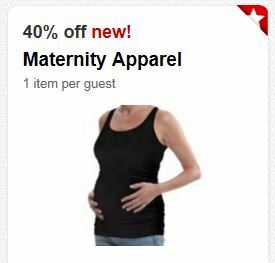 There is a new Target Cartwheel today for a whopping 40% Off Maternity Apparel (limit one item) x2/15. I don’t see a limit on the number of people who can load it – but I wouldn’t wait. If you have interest – add this Target Cartwheel now if you think you will be using it. This offer is valid thru 2/15 and there is a limit of 1 item per guest. Offer includes shirts, pants, dresses, swimwear and denim and excludes nursing bras & clearance. There is also a Target Coupon you can use to maximize your savings on this offer- a $3 Off Women’s Apparel Purchase $15 or more Target Mobile Coupon x2/7 that does not exclude maternity wear. There is also a regional insert coupon you may have for $1.50/2 Mars Snickers, M&M’s, Milkyway, Twix or Mini Mix 8 oz+ 1-12-14 RP that also does not expire until after valentine’s day- on 2/23. 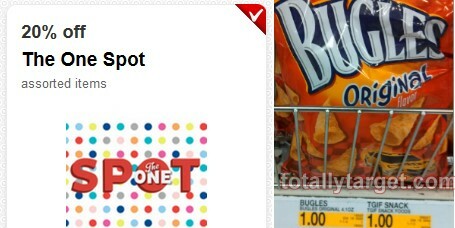 Also new on Target.com today is a printable store coupon for Jergen’s …. If you have had your eye on anything in your Target’s One Spot (the Dollar Spot) we do have a nice 20% Off The One Spot (ETS, Clearance) Target Cartwheel . valid thru 2/8. Another thing to keep in mind with this cartwheel is that many Target stores carry some brand name snacks in their One Spot. -Thanks for the heads up to Denise H.! 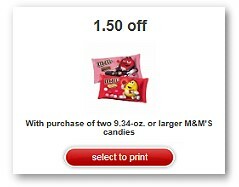 If you missed out on the $1.50/3 M&M’s Target store coupon, it is now back and has a new expiration date of 2/8. Aside from the 12 oz Football M&M’s on sale this week- there are others within the right size range to qualify for the $2/3 coupon for a nice deal. Keep in mind our M&M’s cartwheel will be expiring on 1/31..